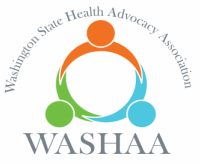 Overview of Presentations Offered by Washington State Health Advocacy Association. Have you ever left your doctor’s office wishing you could have more time? In today’s primary care visit, time is short and there are many issues to cover. How can you be effective and respectful of your doctor’s time and get answers you want? This session explores how to the make the most of your doctor visit. It will review some of the most important ways people can be prepared by applying common health advocacy skills. Be ready for an interactive, hands-on session, with must-know tips for anyone who has ever assisted family, friends or themselves in navigating the health care system. Patient Know More ... Patient No More! ​Learn more about how to improve your health care experience with skills and insights into becoming more active in your own health. Everyone has the ability to seek better choice and control in health care decision-making. This session will review some of the most important ways people can become full Participants by applying common health advocacy skills. Be ready for an interactive, hands-on session, with must-know tips for anyone who has ever assisted family, friends or themselves in navigating the health care system. ​What is health advocacy and how is it being used in the health care setting today? Learn about the field of health advocacy supporting how patients can gain better choice and control in health care decision-making. For employers, health advocacy can mean decreased costs and better health outcomes. In this session learn who is hiring health advocates, how health advocacy professionals work and the value they provide to patients, families and employers. This is an introductory session on the field. People who visit the doctor forget 80% of what the doctor says the minute they leave the doctor’s office. Having a trained volunteer health advocate can help ease the burden of preparing for a doctor visit, taking notes, understanding what the doctor is saying and keeping track of the medical record. This training is for anyone who wants to volunteer as a health advocates and families or patients who want to learn more about the skills health advocates use. This training is geared toward people with a non-medical background who want to make a difference with specific health advocacy tasks such as: gathering medical records, discussing health care needs, creating a list of questions for the doctor, or attending and taking notes at a doctor visit. Advance care planning (ACP) is the process of reflecting on your wishes, values and goals for end-of life care; designating a person to make decisions for you when you cannot; documenting your choices in an Advance Directive and sharing them with your loved ones and health care providers. In this session, participants will: identify values, beliefs and what ‘living well’ means; how to select and prepare a health care agent to be an advocate; consider what treatment options are preferred if something sudden happened and learn how to start a conversation about your wishes. Are You Interested in One of Our Programs? Click Here to schedule a presentation, or contact us at: 206.377.3000 or info@washaa.org.